Our family pets playing on the beautiful Beach at Safety Cove Tasmania 2012. The two dog's names are Sachi and Zara. We found the beach whilst we traveled around beautiful Tasmania. Safety Cove is near Port Arthur. Thanks so much Yvonne for your entry and best of luck in the contest. If the family is lucky to have a dog we all know that they are an actual member of it! you are ever so lucky to have 2 doggies! And doesn't it look like they love each other. I bet that they provide amazing memories for you. 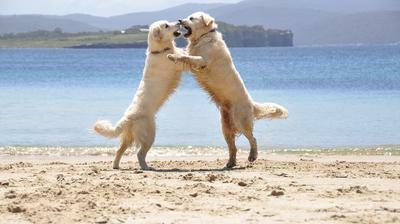 This is a seriously sweet picture of your dogs on the beach. Wow. Makes me wish I had a dog and that I was on a beach in Australia :-) We do have a kitty, but dogs are the best !!! Join in and write your own page! It's easy to do. How? Simply click here to return to Photo Contest 2013.